Carolyn Dunn--director of UCSC’s American Indian Resource Center, managing director of the campus’s student resource centers, and literature lecturer—will direct a new play by acclaimed playwright Mary Kathryn Nagle at the National Congress of American Indians annual conference in Tulsa on October 14. 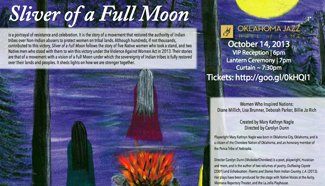 Titled Sliver of a Full Moon, the play documents the reauthorization of the Violence Against Women Act, signed into law by President Obama on March 7, 2013. The Act recognizes the inherent sovereignty in American Indian Nations to prosecute non-Indians who commit acts of domestic violence on Native lands. “This is a wonderful opportunity for both our center and UCSC to have this type of involvement in national policy issues regarding American Indian issues,” Dunn noted. The National Congress of American Indians (NCAI), founded in 1944, is the oldest, largest, and most representative American Indian and Alaska Native organization serving the broad interests of tribal governments and communities. “In participating with both NCAI and the National Indigenous Women's Resource Center, this will bring our American Indian Resource Center to a new level of national recognition and networking that we have not achieved until now,” Dunn added. Dunn is a poet, playwright, and musician, as well as the author of two volumes of poetry, Outfoxing Coyote (2001) and Echolocation: Poems and Stories from Indian Country, L.A. (2013). She is also the co-editor of two volumes of American Indian prose and poetry, and co-author (with folklorist Ari Berk) of Coyote Speaks (2008). Dunn’s plays have been produced for the stage with Native Voices at the Autry, Montana Repertory Theater, and the La Jolla Playhouse. Her scholarly work in the field of American Indian literature and theater have appeared in several anthologies, including Reading Native American Women: Critical/Creative Representations, and American Indian Performing Arts: Critical Directions. Dunn noted that the campus’s American Indian Resource Center will be participating in a publishing project with the National Indigenous Women's Resource Center later this academic year. She said that UCSC AIRC students will have the opportunity to contribute to that project in areas ranging from writing and editing to production. Dunn will also be teaching a course on feminism and Native American literature at UCSC in the spring.